When you think about summer food, you think burgers; you think salads, skewers, and char-grilled corn. No matter how you list your ideal summer nosh, it’s highly unlikely that soup makes the cut. Last week I was put onto a project where I had to create a compilation of different gazpachos and chilled soups. Now I’ll be honest – the first time I’d ever heard about cold soup I crinkled my nose. Soup, as I’d known it throughout my entire life, was to warm your body and heal your soul. Soup was made to curl up with on a chilly day while wearing wool socks and a flannel shirt. I couldn’t fathom the idea of eating it to cool myself down from the beating sun. The fact that I’ve always had a strange aversion to cold food that should be heated didn’t help, either. Unwrapping leftovers prior to reheating them has always made me squeamish. However, while doing my research, I grew more and more intrigued with this whole “chilled soup” thing. There are some gorgeous recipes out there and those writing about them are pretty darn keen on them. Low an behold, this past weekend, I decided to give it a whirl. In the words of Cyril Figgis… Jeezy Petes. The result was a winner; a super nourishing crisp and cool soup that invigorates you and gives your body all of the nutrition it craves on a scorching summer day. Most gazpachos have a tomato base, but I went green. I used up some zucchini, the leftovers of a bell pepper, some scallions and fresh mint. Even after the initial spoonful, squeamish me wasn’t weirded out at all. This just works. Another element of the classic gazpacho that I decided to forego was the bread. Typically, a few chunks of bread are added during the blending process in order to help thicken the soup. I used chickpeas instead and they worked wonderfully! Why add carbs where they aren’t needed, right? Plus, chickpeas are a great source of protein. Win! 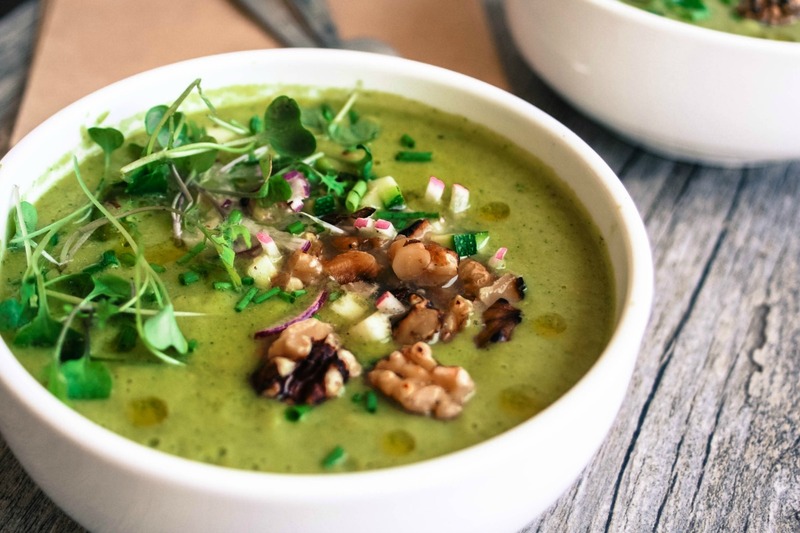 To add some texture to an otherwise smooth and velvety puree, I garnished the soup with some diced zucchini, sliced Easter egg radishes, toasted walnuts and microgreens. I feel I must add that the toasted walnuts are a must – not because the soup is lacking without them, but because they are so friggin’ good. SOUPCombine all of the soup ingredients into a blender and blend until you have a smooth puree. If you prefer a chunkier soup, pulse until you reach your preferred consistency. Transfer to a container and chill in the fridge for one hour. When ready to serve, ladle soup into bowls and garnish as desired. Yep, Imma be making this one soon. Love a good gazpacho in the summertime and these innovative toppings sound divine. Just pinned and can't wait to make it soon! So lovely! Thanks, Justine! I hope you love it. I'm definitely a fan of it now that I've tried it. Glad I smartened up and stepped outside of my comfort zone. Haha. Gazpacho -the red one- is good, but I'm sure I'd love your version more. The look and the ingredients are so appealing! Love the addition of chickpeas and the topping adds even more appeal. Great job! I think the red one is what deterred me from trying chilled soup, to be honest! I love me a hot bowl of tomato soup with grilled cheese, so picturing it cold was frightening – but if I've learned anything, it's that you can't knock it 'til you try it. Thanks for the comment, Nicoletta! I'm still a little nervous to try any chilled soup but I think you've edged me a teeny bit closer getting over my fear. I like the idea of a refreshing, nourishing soup in the summer but... Ah! I don't know! But still, I love everything happening in this gazpacho! The chickpeas really appeal to me and all of your topping choices sound so delicious. Haha, I totally hear you Brittany. I was never even intrigued by it until I had to research a bunch of variations for it for a project. Once I learned how many different flavors you can actually use, I was sold. Traditionally it's a tomato base and for me, tomato soup needs to be hot (and paired will a stretchy grilled cheese sandwich). I think that's what deterred me from gazpacho for a long time. I'm glad I tried it, though. If you end up giving it a go, I hope you're into it. This gazpacho looks amazing! I only had gazpacho maybe once or twice before, but this one in particular looks so tasty. My parents garden is overflowing with zucchini and they keep giving them to me. I think I know what I will be making next!! This looks SO delicious. You know I have never had cold soup before. I don't know why, but looking at this...I will have to venture into the kitchen and give this a try. YUMM!!! !